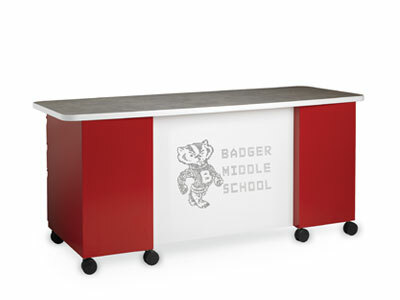 Desk products for Education from Invincible Furniture. We have been manufacturing the full pedestal Classic Cube series for over 30 years. Invincible strong! Single and double ped versions available from 48" x 30" (single ped) all the way to 72" x 36" (double ped). Pedestals are full extension and lock individually. Optional center drawers, grommets and casters. You may also configure the Cube series in “L” or “U” configurations with returns and hutches. NEW Invincible ES Freedom / ES Ironworks / ES Fundamentals series teachers desks (Instructor Workstations) feature cutting edge design! Available with standard round, steel tubular “T” leg shown on right (ES Freedom series) or sleek slim profile Ironworks leg and foot. Also available with a smaller footprint (smaller worksurface and shorter depth pedestal) Fundamentals leg and foot. Designed by teachers specifically for the K-12 Market, our Spirit series has been used for decades in schools. Built with Invincible quality, the Spirit series is a smaller footprint desk that can be configured the way you want it with your choice of bookcases, pedestals, and lateral storage. The Spirit series comes with a standard D top and can be ordered in single or double pedestal configurations. Cable and wire management are standard. Need a custom configuration? Just ask! Options include plastic or steel center drawers, rectangular tops and pull-out shelves. 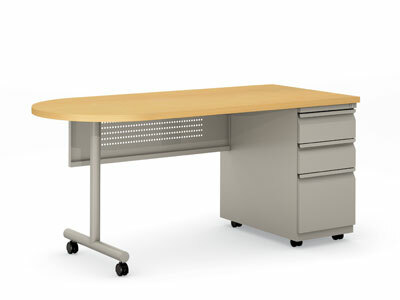 When pedestals are included with casters, this makes your Spirit desk mobile. Desks come with one standard grommet. Ships fully assembled. Wilsonart laminate is standard. 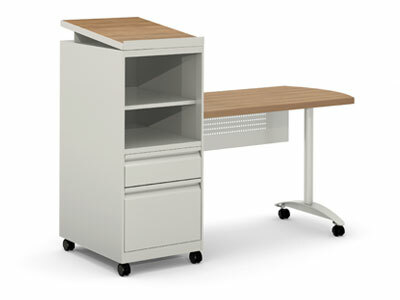 NEW Invincible Educator Series mobile teacher desks are a small-scale unit on casters that offer exceptional mobility to allow instructors to move easily from room to room. 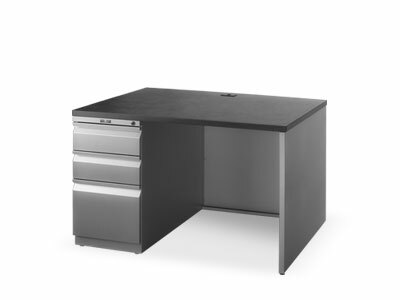 The optional flat D top offers a large workspace for papers or a laptop, while the tower incorporates storage for teaching materials and an angled podium to prop materials for lecturing. Specify a modesty panel for privacy (optional perforated modesty panel available). Comes with protective T-mold edge molding and grommets to keep wires looking neat and clean.